The ultimate top for your Alphacool power pump offers even better performance as well as more mounting and connective possibilities for your favorite pump! The base performance of the Alphacool TPP & VPP is already truly exceptional, but what if there is a possibility to improve even on that? This idea was also what has driven the developers which have created a product that does not only increase performance but also offers other additional advantages over the base model pump. One of the greatest advantages are the G1/4” connection threads both at the sides and top of the pump cover. Both can be used separately or even in a combination. For the unused connection threads two knurled copper plated screw plugs are included. The design is also a factor which was not taken lightly! The elegant transparent Plexiglas material with integrated Alphacool logo gives a clue of the potential of the German Know-how in these tops! Mounting is done quickly and easily. With a simple twisting motion the motor is separated from the mount. After that you will find 4 separated basic components. First pull the O-ring over the polished silver front piece of the pump and then push on the largest of the 4 components. At the back, where the cable is coming out of the case, the counterpiece is pushed on. With the included mounting screws the elements can be tightly connected and you are done! And what purpose has the last plate? 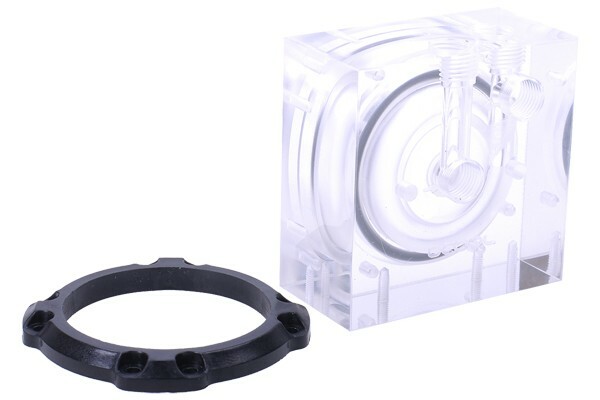 It can be used for mounting of the pump in the case! Simply screw the plate to the pump’s top and the opposite side to the case or decoupling module and you are set to go! And you will notice: This is yet another great piece of engineering from the Alphacool team! The installation manual of Alphacool HF D5 TOP you can find here as Download. Note regarding mounting: After mounting a small gap remains between pump and top. The fit is tight as the O-ring ensures a safe seal. Hence do not over-tighten the screws, as it may result in damages to the top. Le MCP 650 est une pompe D5 standard et donc compatible avec celle-ci top. Fit with alphacool vpp755 pump?